Surely many will agree to it. No doubt cleaning the gutter is a dreadful job. Especially if you are averse to long time cleaning process and aged. Rain gutters are hardest part of your house to clean. If you have a roof which is more than 10 feet high, then it becomes much more difficult. There are different tools which are available today to make the job easier. 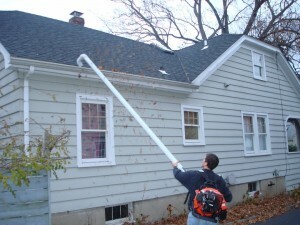 Gutter cleaning using blower is one of the options which are easy and convenient. Gutters are packed usually after fall season especially if you have trees nearby. If not cleared regularly, the leaves may get clogged in the gutter and can lead to water getting stuck in gutters. This can lead to many other problems like seeping, rotting, etc. Simplest method that anyone would use first is to climb up using a ladder and clean it by you using normal tools like brushes. However, it is the least convenient one since you will have to repeat the cycle of climbing up and down quite a number of times. It is practically not convenient if the gutter is two storied and high. Other option is to use a tool like blower or vacuum cleaner, which will blow the leaves off from gutter. One can use an air blower or pressure water sprayer. All methods have their own list of pros and cons. Using an air blower is preferred option by many. One is due to the fact that air blowers are relatively inexpensive. Some basic air blowers are available for less than $100. Also, air pressure cleaning is a lot easier and less messy compare to water pressure cleaning. One has to simply use a tool which can be fixed to the end of blower. This makes it easier to reach high roofs and redirect the air into right path. These are tube attachments which fit to your blower hose and redirect the air to the gutter easily. Blower attachment is best suited for gas or electric blowers. The attachments are usually 7 to 10 feet tubes, which will have kits to attach them to the leaf blower gutter extension hose. The attachments will have a curved portion at the end to redirect the air and create right pressure points. The end of attachment can be 120 to 180 degree curved tube. The attachments are designed to fit to multiple blowers. There are some standard ones which are available for ECHO and still blowers. Attachments will have more than one tube extensions. Additional tube extensions will help to adjust for different building heights. They can be easily used with hand blowers. They are handy and low weight ones. No doubt that the blower attachments are great tools for cleaning gutters. There are some additional precautions that you should mind while buying and using them. While using an air blower extension uses safety equipment which are necessary to protect yourself. A pair of Goggles and gloves is recommended while using these. Mind the clothes that you wear during cleaning process. Air blowing can be messy sometimes. If there are blockages, clogging and water, whole process can become messy. Make sure the kit has extensions which can be fit together easily. The extensions should hold on firm since the air is burst out at high pressure. Common complaints are that the extension tubes come off due to high air pressure. Gutter cleaning has been made a simple task by Gutter attachment for leaf blower. They are great tools for cleaning chores. It is inexpensive but great tool which can reduce time and effort required for gutter cleaning.